It’s no secret that one of my favorite things about Disney is the food. I’m back to discuss a hidden gem in Disney dining located at the French Quarter Resort. Sassagoula Floatworks and Food Factory takes you straight to the Deep South with its New Orleans inspired cuisine. During our last Disney trip, I had the opportunity to dine at this impressive location. I know what you’re thinking, isn’t that a food court? And yes, technically it is. But, Floatworks is full of charm and unique menu selections. Here is the breakdown of what is offered in each section. The highlight of this section is the fried chicken on a biscuit. This entrée is truly southern in style and is served with generous portions. The crawfish mac & cheese burger is another great taste of New Orleans that can be found at the Grill. 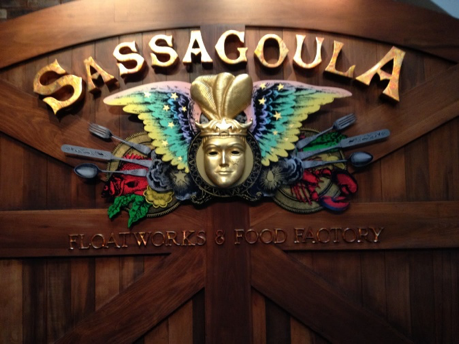 It’s no secret that the gem of the French Quarter are the beignets that are served in the Floatworks bakery. Ask for yours with caramel sauce – you won’t regret it! 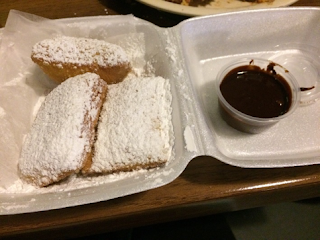 There are also several other great options including a beignet gelato sundae and Mardi Gras king cake. If you’re on the dining plan, this is the stop for you. Ask for the prime rib to get the most bang for your buck. Entrees in this section are also served with tasty side item options: red beans and rice, mac and cheese, and mashed potatoes. This stop offers a create-your-own pizza for traditional folks. You can also try a New Orleans classic – shrimp and grits. Here’s the star of the show for me. Floatworks offers some great Louisiana favorites here including Gumbo and and Po’ Boy sandwiches with catfish, shrimp, or beef. These items are cooked on the spot and full of flavor. I was thoroughly impressed with my entrée. Floatworks now sits at the top of my list for counter service options at Disney. If you’re a dining plan fan, this is a great place to visit. There is a wide variety of choices that are quite different from your usual burger and fry options. The beignets alone are worth your trip out to the French Quarter. The resort is beautiful, and the food is quite memorable. Next time you’re near the Disney Springs Resorts, don’t forget to stop by Floatworks.